Find our cheapest flights to Rotorua from Auckland, Wellington, Christchurch, Sydney and more. Rotorua is New Zealand's coolest hot spot - a volcanic region with naturally-heated springs, geothermal sights and a massive choice of adventures. 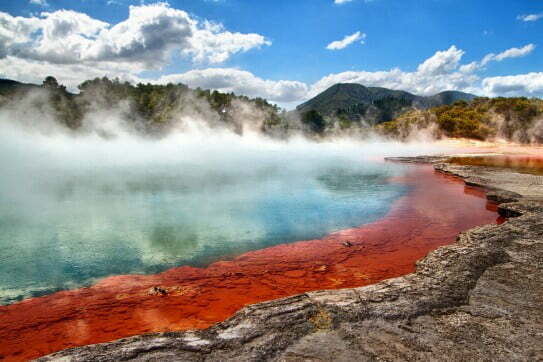 When you first arrive in Rotorua, the scent of sulphur lets you know you're somewhere like nowhere else. Steam rises from fumaroles, craters and hot pools in the city's parks, while the geysers of Whakarewarewa erupt almost constantly. To fully appreciate Rotorua's subterranean magic you can visit remarkable geothermal areas like Wai-o-Tapu, Hell's Gate, Waimangu and Orakei Korako. Your phone's camera app will get a lot of exercise. Since humans first arrived in Aotearoa, Rotorua has been a focus for Maori culture. Attracted by the comfort of unlimited geothermal energy for cooking and warmth, Maori settlers made themselves at home around 600 years ago. Today their descendants keep many ancient traditions alive. You can learn about the culture, enjoy the amazing performance art and discover the smoky succulence of hangi (earth oven) food. Rotorua's hospitality is perfectly expressed with the word manaakitanga - a deep-rooted concept that inspires the local community to offer visitors the best experience. Surrounded by native forests, mountains, lakes and rivers, Rotorua is a great place to get on your bike and reconnect with nature. The Whakarewarewa Forest has mountain biking trails for everyone, from absolute beginners to world champions. There's also Te Ara Ahi, a two-day 48km biking trail that takes you on a spectacular journey from the city up to hot pools in Waikite Valley. Another enthralling experience is Wingspan, a bird of prey centre in Paradise Valley. Seeing New Zealand's feisty falcons do their thing is beyond awesome. 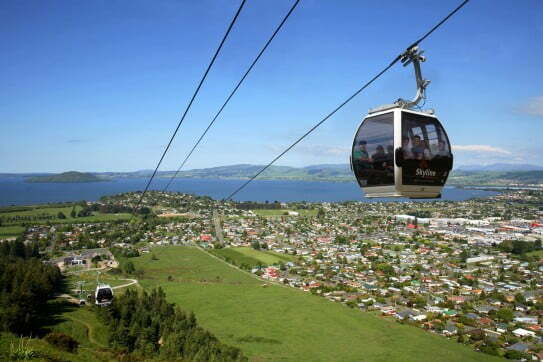 Rotorua has always been a top spot for family holidays, because there are all sorts of adventures within easy reach. As a group you can catch a gondola up Mount Ngongataha, then spend a few hours racing each other on the luge tracks. Rainbow Springs nature park is another idea for family fun, because everyone loves feeding trout and seeing kiwi. Another enthralling experience is Wingspan, a bird of prey centre in Paradise Valley. Seeing New Zealand's feisty falcons do their thing is beyond awesome. Jet boating, ziplining and rolling down hills inside giant transparent balls are other Rotorua fun times you can discover. Honestly, there's never a dull moment in this New Zealand hot spot. Geothermal attractions are the main reason to visit Rotorua, and these are bubbling and hissing all year round. But we'll let you into a secret: the colder temperatures of winter make everything steamier and more mysterious! Rainfall is spread evenly throughout the year, so biking and hiking are activities for any season. Waimangu Volcanic Valley image courtesy of Destination Rotorua Marketing.